Now that HB 1319 is through the Senate, we’re closer than we’ve ever been to ensuring state law explicitly protects transgender Granite Staters from discrimination in housing, employment and public places like restaurants and hospitals. That Senate vote was the biggest political hurdle HB 1319 has faced, and we wouldn’t have cleared it without transgender people bravely sharing—and allies lifting up—their stories. But it also required our senators to show real political courage. Some weren’t initially with us, but they listened to us with open hearts and minds, and made the right choice: To stand on the side of freedom and fairness. When our lawmakers stand on the right side of history, it’s important to say thanks. 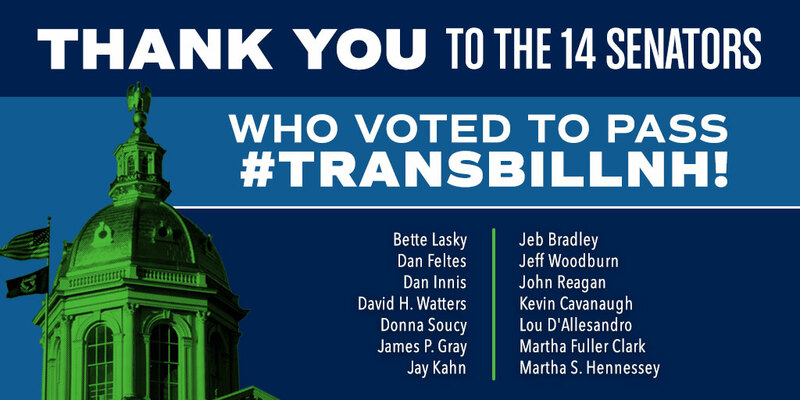 Send a short personal message of thanks to the 14 senators who voted to pass HB 1319. Then, follow it up with a quick message to Governor Sununu, thanking him for his promise to sign HB 1319. Saying thanks is especially crucial right now, because there’s still one thing that has to happen before HB 1319 becomes law: Governor Chris Sununu has to sign it. After the vote, he made it clear immediately that he plans to, but that hasn’t stopped our opponents from calling, emailing and tweeting at him daily with the hope that their misinformation will scare him away from signing HB 1319. Showing our lawmakers that we’ll have their backs when they do the right thing sends a signal to Governor Sununu that he can win our thanks too—by signing HB 1319 as soon as it hits his desk.